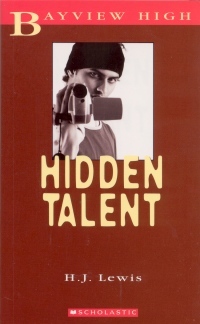 CM Magazine:Hidden Talent. (Bayview High). Markham, ON: Scholastic Canada (Published by arrangement with Tea Leaf Press), 2008. The Sad and Pathetic Life of Vishal Chopra. It sounded like a movie title. He got out his video camera and set it up on the tripod. Then he sat down in front of the camera. With the viewfinder turned around, he could see himself on the tiny screen. Using the remote control, he zoomed in and hit the record button. "Hello," he said to the camera. My name is Vish. It's Saturday night and I'm trapped in my room. Don't tell anyone, but I'd rather be watching the Cindalee Ashley movie right now." Fade to black. It doesn't matter how hard he tries, Vish cannot be the excellent student that his brother and sister are. Now they're off to further their educations and establish awesome careers, but Vish can't even pass a test in high school. Then there's the video camera he bought with his savings, and now his parents have grounded him because he refuses to take it back. They just don't understand, but then, they also don't know what his hopes and plans are because Vish does not want to let anyone know. On top of all that, Mara, his girlfriend is jealous of a new girl that Vish has to do a project with, and Vish is feeling pressured from all angles. Does he have what it takes to make movies? He just doesn't know where to start so he plans to enter a video contest and then finds help and support in his new friend, the last person he would ever believe knows anything about movies. The Bayview High series deals with real issues and pressures faced by teens in today's high schools. H. J. Lewis's character, Vish, faces pressure from family and friends but also from himself. His lack of confidence in his abilities makes progress slow and painful, but he is determined to do his best. Author H.J. Lewis tells it like it is. And from a teacher's point of view, I know only too well what young teens face in their daily lives. Young readers will relate to the characters and issues in this book. It is written with students of all reading abilities in mind and includes a very helpful glossary on the final pages. Elaine Fuhr, a retired elementary and middle school teacher, lives in Alberta.